I’ve been reading some new cookbooks lately and found a fantastic gluten-free, grain-free cookbook that’s all about breads. And not just breads – but also muffins, cookies, cakes tortillas and even donuts. It’s called the Gluten-Free & Grain-Free Breads, Batters & Doughs by Halle Cottis of Whole Lifestyle Nutrition. And here’s one I was excited to try… the Grain Free Chocolate Chip Mini Muffins Recipe. Yum! This isn’t any ordinary chocolate chip muffin recipe. This one is both gluten free and grain free PLUS it’s made with pumpkin spice – giving it a delicious fall flavor. My kids went nuts over these muffins. They begged for more and I discovered them just in time to take to my oldest son’s school birthday celebration. I love that this recipe is just a few ingredients and free of artificial ingredients. 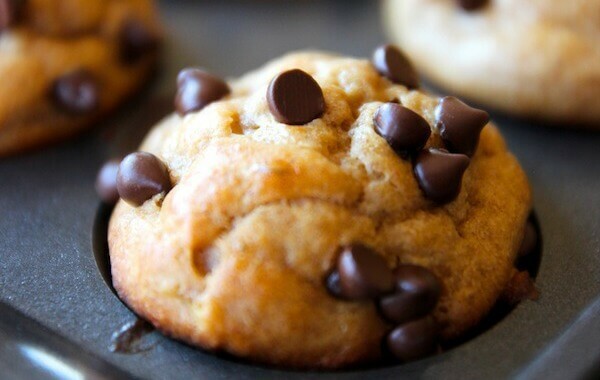 Did you try these grain free chocolate chip mini muffins? Don’t forget to rate the recipe and comment below to let me know how it went. You can also FOLLOW ME on Facebook, Instagram and Pinterest to see what other fun things I’m getting up to. 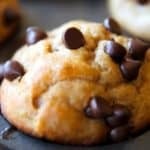 This Grain Free Chocolate Chip Mini Muffins Recipe is delicious and the perfect snack to pack for kids lunches or to enjoy after school. Place all ingredients except the chocolate chips into a blender or food processor. Stir in chocolate chips. You can add more to the top before baking for more of a chocolatey flavor. Pour batter into a greased muffin tin filling about 2/3 of the way full. You can also use a mini muffin tin to make 24 mini muffins. Cook for 17-20 minutes for full size muffins and 12-14 minutes for mini muffins. Allow the muffins to completely cool before serving. Store leftovers in the refrigerator. Gluten Free & Grain Free Breads, Batters & Doughs is filled with baking tutorials and tips to help you convert your favorite recipes to become gluten and grain free. It even includes a detailed section on measuring techniques and how to convert recipes for gluten and grain free cooking and baking. Gluten Free & Grain Free Breads, Batters & Doughs is on sale now for just $19.95 (regularly $24.95). Don’t miss out on this sale. You can even download a sample chapter. Mmm I love that there is pumpkin spice in these too! sandwich roll ups and tortilla chips will be first on my list to make oh my yippee! I would like to make the gluten-free tortillas and sandwich roll-ups! I would love to try the Brazilian cheese bread, looks delish! I want to make the Blueberry Lemon Poppyseed Muffins! I’d love to try the Brazilian Cheese Bread recipe…yummy!